Sarah Palin at Sunday’s protest at the World War II Memorial in Washington, D.C.
Here’s a good rule of thumb. If Sarah Palin appears at your political gathering you're going to lose. She's become a bellwether that's more accurate than a farmer’s almanac. If that famous beehived and bespectacled face comes within 500 yards of your political event you have just lost the American public. Depend on it. Just ask Senator John McCain, one of the few remaining members of the GOP who hasn't lost his mind and joined the circular firing squad over the Affordable Care Act. “To somehow think that we were going to repeal Obamacare, which would have required 67 Republican votes in the Senate, was a false premise, and I think we did the American people a great disservice,” McCain said last week. But neither McCain's nemesis Palin, nor his strongest critic, Senator Ted Cruz, were in any mood to be embarrassed or ashamed over the shutdown last weekend. In fact, in a moment of political cynicism that may set the benchmark for the decade, the far right pair turned up to recite the Pledge of Allegiance at an anti-shutdown rally on Sunday at the World War II Memorial in Washington. 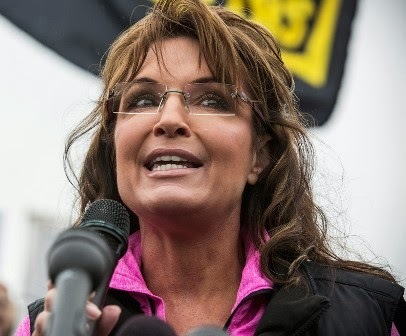 For months Cruz worked tirelessly to shut down the government, a move which Palin supports. Then they turned up to protest a war memorial that had closed due to the shutdown. In the old days, when journalists used to notice these kinds of glaring inconsistencies, they would have called that an act of breathtaking hypocrisy. Today's cowed news media simply note that they showed up to a protest. Well, because the park rangers have had their budget cut by the shutdown and they're not getting paid, Senator Cruz. That was easy. Now let me ask a simple question too, Senator Cruz. Why is the GOP, the party of fiscal responsibility, blowing an estimated $300 million a day of the public's money on a pathetic and pointless shutdown? Will there be a time when you feel compelled to answer that? Here's a detail that you might have missed amid all the malarkey. The crowds have long ago dismantled the barricades at the World War II Memorial on the National Mall, daily defying the government shutdown and stepping past the park rangers who have not been paid since the shutdown began. Thoughtfully, the Park Service has been allowing free access to the tourists, veterans and even the odd Tea Party demagogues who show up since the shutdown began, even though officially the memorial remains closed. “Our veterans should be above politics,” wailed Cruz at the political protest. “Why is the federal government spending money to erect barricades to keep veterans out of this memorial?” he asked the crowd, prompting some commentators to wonder if he actually understood how his own actions lead to the closures? In their public lives Palin and Cruz have done everything possible to limit or eliminate benefits for veterans, including health care, yet here they were waving the flag and pledging allegiance before the cameras. Palin has said that a shutdown would allow the American people to realize “how irrelevant the federal government could and should be in our lives.” Unpaid park workers take heart, eh? Then she and Cruz led the protest of the shutdown she supported. It was the biggest red meat spectacle of the shutdown so far, which is why we should reflect on it. The majority of “veterans” that turned up to this self-critical protest were actually fellow Tea Party members, of course. That goes without saying. Apparently they're so angry at themselves for shutting down the government they had to call themselves out in a public spectacle. Larry Klayman of Freedom Watch, the conservative political advocacy group, was in no doubt about who to blame for making Republicans shut down the government -- the Muslim Kenyan Socialist who is also our president. “I call upon all of you to wage a second American nonviolent revolution, to use civil disobedience, and to demand that this president leave town, to get up, to put the Quran down, to get up off his knees, and to figuratively come out with his hands up,” Klayman said. Look, I've seen a lot of strange stuff, but I cannot comprehend how GOP members can protest a government shutdown when they shut it down themselves? That’s just weird. So was the decision to wave so many Confederate flags at the protest. I'm not sure how it respects our veterans to carry the flag that created tens of thousands of wounded veterans, but we're three county lines past common sense in the self-satirizing Tea Party republic these jokers want to lead us to nowadays.